Looking up at the night sky, we can see thousands upon thousands of glittering lights emitted from stars, planets, galaxy clusters, and many other celestial bodies. How brightly the stars glow depends on how far away they are from Earth, as well as their mass, volume, and chemical makeup. Of course, it’s impossible to see stars beyond a certain distance, since their light can’t reach us—at least, not with the naked eye. But using telescopes with specialized optics and sensors, scientists can “see” objects in space that are billions of light years away. A new astronomical camera developed by scientists at Berkeley Lab, Yale, and the National Optical Astronomy Observatory promises to deliver the fastest, most comprehensive images that have ever been taken of our starry sky. The camera, called Mosaic-3, is an upgrade from previous technology due to the incorporation of cutting-edge sensors that contain large light-capturing devices, specifically designed for monitoring wavelengths of light longer than the human eye can see. Light coming to us from very great distances is typically shifted toward longer wavelengths, in the same way that the sound waves of a jolly song played on an ice cream truck stretch out as the truck drives off, making the song’s pitch lower. That’s why the Mosaic-3 was custom-built to observe those long wavelengths, allowing it to see stars, galaxies, and bright black-hole fueled objects called quasars that are otherwise invisible to us. The Mosaic-3 was installed last fall on the Mayall telescope at Kitt Peak National Observatory in Tucson, Arizona. 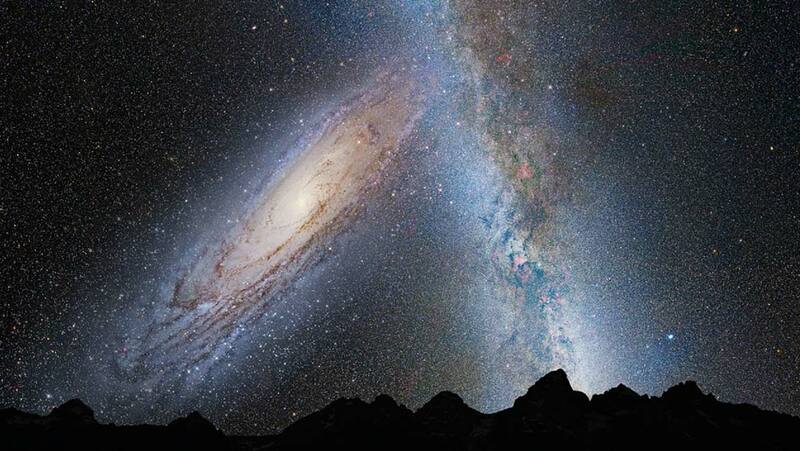 Its mission is to watch the northern sky and collect all light coming from it within a certain range of wavelengths. This sky survey follows on the heels of the Sloan Digital Sky Survey, ongoing since 2000. The Sloan survey provided a breakthrough in astronomical observations, creating incredibly detailed 3D maps of our universe to help scientists understand more about its structure and behavior. It also produced multicolored images of nearly half our night sky, made up of light collected at a variety of different wavelengths. More than 3 million known objects in the universe were captured in the survey and the light intensity at each wavelength was measured, which reveals information about the chemical composition and therefore can tell us whether the object is a young star, old star, red dwarf, or supernova. Thanks to the updated technology of the Mosaic-3, future surveys will be able to see galaxies 10 times fainter than those detected in the Sloan Survey, and take pictures twice as fast. Not only that, but the images collected by Mosaic-3 will help scientists mark special galactic systems for further observation by the upcoming Dark Energy Spectroscopic Instrument, DESI for short, currently under construction with an official launch date in 2018. DESI is a project led by astronomers at Berkeley Lab, and is expected to map objects in the universe as far as 12 billion light years away. (To envision just how far that is, know that each light year is 6 followed by twelve zeroes in miles. And you thought your cross-country road trip was long!) Armed with the astronomical amount of data obtained by DESI, scientists will be able to calculate the speed at which galaxies and ultra-bright quasars are moving away from Earth, as a result of the expanding universe. If we can figure out those exact speeds, we may discover something new and exciting about the nature of “dark energy”, the mysterious cosmological force that many believe is causing our universe to spread out faster and faster over time. Since its installation in late 2015, Mosaic-3 has been collecting images almost every night that cover about 12% of the night sky. The data from the camera and from other telescopes is all published online for anyone to view and download at http://legacysurvey.org. The most recent full map was released in September and features color images showing light that was emitted in both visible and invisible wavelengths from the furthest corners of the cosmos. Plus, you can check out the Sky Viewer feature to look at the infinite depths of space from every angle, as if you were an astronaut floating out there among the stars. Given the amazing advances in astronomy and telescope technology, even the most earthbound of us can feel like a space cowboy with a mere click of the mouse, and can see further and further into the invisible reaches of the universe like some kind of cosmological Big Brother. It’s only a matter of time before our ever-sharper space eyes glimpse something that changes everything we thought we knew about this universe we call home. Roberts Jr., Glenn. “New Galaxy-hunting Sky Camera Sees Redder Better.” Berkeley Lab News Center, 2 Feb. 2016, http://newscenter.lbl.gov/2016/02/02/new-galaxy-hunting-sky-camera-sees-redder-better/ (accessed 12 Dec. 2016). The Sloan Digital Sky Survey. http://www.sdss.org/ (accessed 12 Dec. 2016). The DECam Legacy Survey. http://legacysurvey.org/ (accessed 12 Dec. 2016). “How Long is a Light Year?” NASA Global Learning Technologies Project, https://www.grc.nasa.gov/www/k-12/Numbers/Math/Mathematical_Thinking/how_long_is_a_light_year.htm (accessed 12 Dec. 2016). “What is Dark Energy?” HubbleSite: Hubble Discoveries, http://hubblesite.org/hubble_discoveries/dark_energy/de-what_is_dark_energy.php (accessed 12 Dec. 2016).